Also, for children and families will organize fun activities, educational workshops and on the day of Easter Monday, an easy hike on the Nature of the plateau. 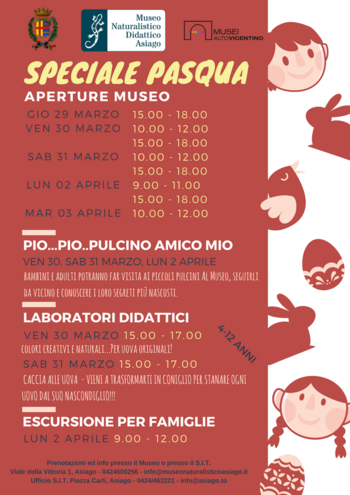 THE NATURE MUSEUM EDUCATIONAL "P. RAFFERTY"
The Asiago naturalistic Museum is a museum that preserves and exhibits natural testimonies related to territory ofAsiago plateau 7 communities. In addition, the Museum also carries out educational activities and outreach and Research, aiming to provide schools with services, materials and training opportunities for students and to act as a point of reference Highland culture for citizens and tourists on all issues related to natural sciences.